In our first two podcasts we talked about dragons and giants of the pre-flood world and why things were all much larger. 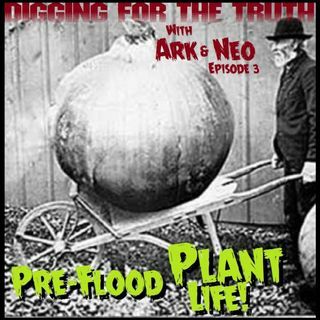 In this podcast we are going to be digging into...no pun intended the pre-flood ground and talking about the rarely discussed subject of pre-flood plant life and the scientific evidence that provides proof that plant life in the beginning was radically bigger and better than the plants and vegetables we have today. Neo is ... See More also going to be sharing with us his personal knowledge and background with growing giant pumpkins and the history of this interesting hobby. He will explain how it provides compelling evidence that the key to growing better plants is to reconnect genetically isolated plant groups and strains and reuniting them back together which brings out the superior ancient traits of that original created kind in the garden of Eden.